The belt is designed for carrying various items of individual equipment, such as the water canteen cover and ammunition case which are suspended on the belt by interlocking slide keepers or by double hooks inserted through eyelets along the bottom of the belt. 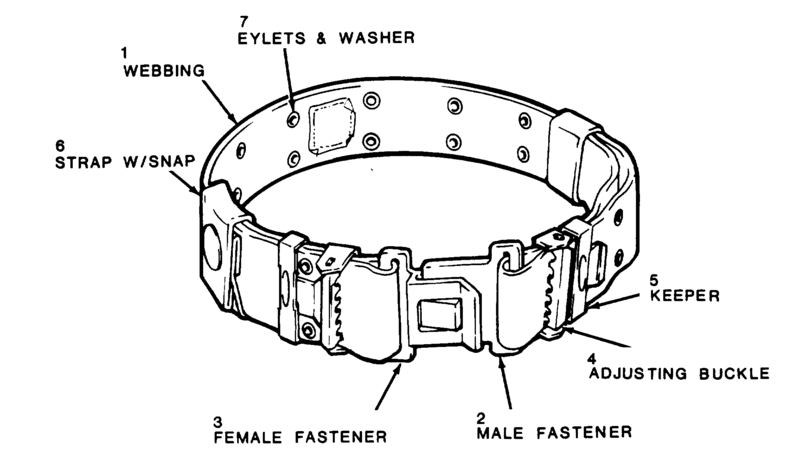 The belt is also used in conjunction with the field pack suspenders, the suspender hooks being attachable to the top edge row of eyelets to help support the weight of the belt and its attached equipment. The belt is made from Army shade 7 olive drab nylon webbing with black chemical finish adjusting buckles, keepers, and a belt buckle. The medium size belt is for soldiers with waists measuring under 30 inches and size large is for those with waists measuring 30 inches or over. The belts are adjusted from each end by means of clamp-type buckles which slide on the belt when open.